Down the gravel driveway past the Australian brush cherry, busy with bees. 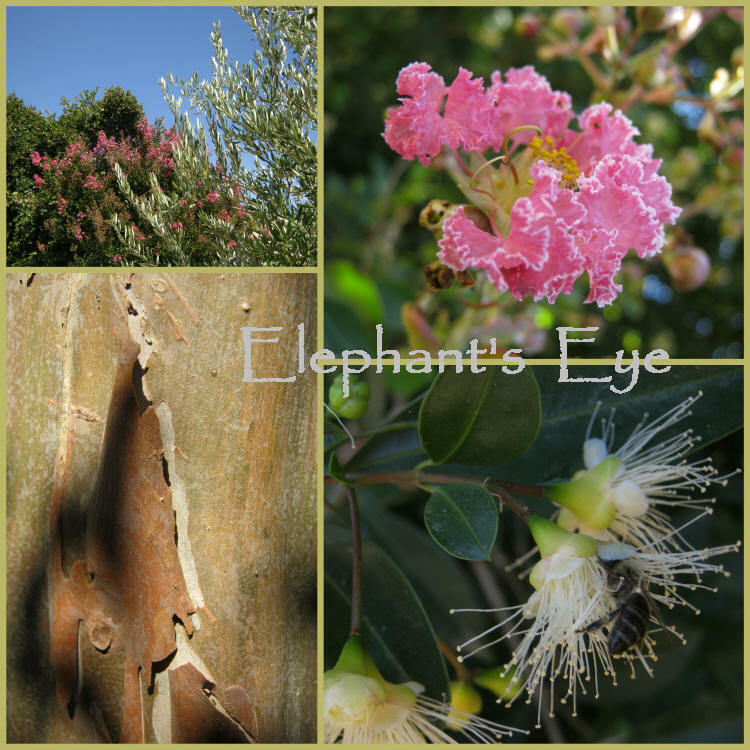 Pride of India Lagerstroemia, across the pond, crepe myrtle. The sunny olives include some strugglers. Then the curved wall to Pushed out of Paradise and the OTT Perfume Passion rose. Come thru the back gate. Figs, plum, and apples. The inherited fruit trees, which need serious pruning and rescuing from death by Kikuyu (grass runners!) Apple Creek should be cleared once a year. 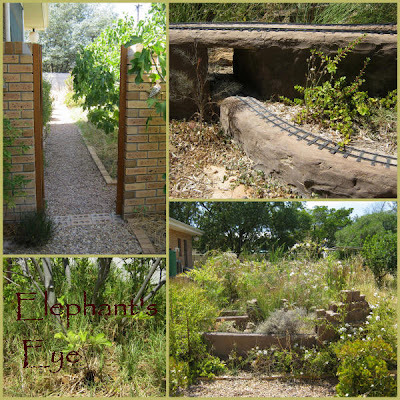 At Elephant’s Eye Light Railway the garden is teaching us. Bronze fennel and hawkweed have seeded themselves happily. Spekboom Portulacaria afra grows with such enthusiasm I spread bits around. Despite the deceased pennyroyal, the impression is still, lush and green. The afternoon sun side of the Karoo Koppie, needs to imitate a stone outcrop. Again the garden teaches me about microclimate – the embattled west-facing side, and the meshed together east-facing side. My source for tough succulent cuttings. This pot stands against the hot north-facing wall of Paradise and Roses. 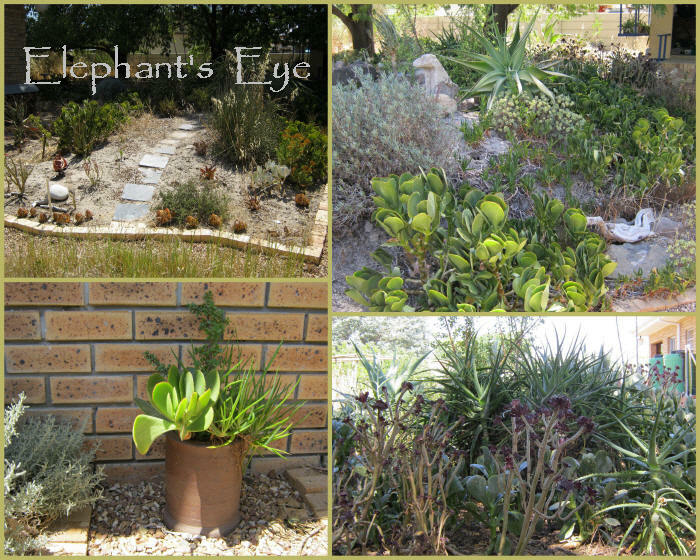 The bed outside our bedroom window- where my optimistic fynbos, died, slowly, one plant at a time. The ash planters – even the Clivia battles – not a shade bed, it catches the hot afternoon breeze. The strip behind the ash planters has a few young trees. The dry difficult stretch between the pond and the ash trees, which suffers from the very worst blast of summer sun. My beloved Dusty Millers are due to be harvested for lots of cuttings, and the woody grandfathers removed. My January foreign flowers. Pink garden hybrid waterlily. Mustardy yellow umbrellas on the bronze fennel, promising more seedlings. A Dianthus and the last of the frazzled nasturtiums AKA Cistercians. From the ash trees, past Rest and Be Thankful, on Ungardening Pond, across Plum Creek. The rooted cuttings and tree seedlings which came with us from the first garden, now conceal the concrete wall. Trees, in fact. Bits of Paradise and Roses need rethinking, especially the pink Spring Promise bed. This winter I will hard prune the rose bushes, after lightly grooming last winter. Looking down each of the four paths in turn. 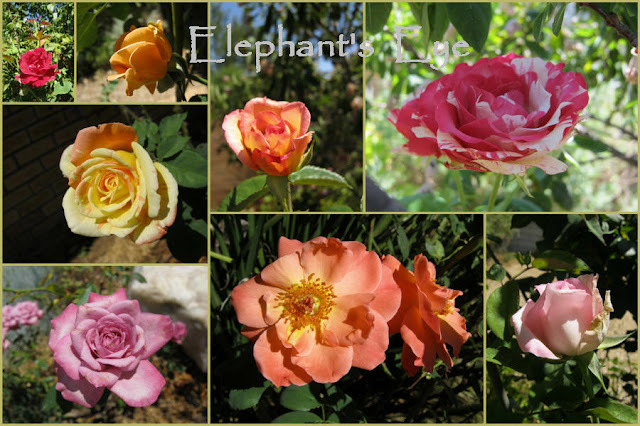 We have Papa Meilland, Chaim Soutine, Perfume Passion and Tropical Sunset in flower now. I walk the garden in two minds. Reminding myself that we started with a flat square. Inherited the 2 thirty year old mountain ash trees, fruit trees, a few flowering shrubs. The glass half empty sees the pruning and replanting. The glass half full, sits on the shady verandah, with a cup of tea, and a good book, always birds chatting. Rest and Be Thankful! Diana - You and the Ungardener have a very interesting garden, filled with so very many corners that beckon you further. 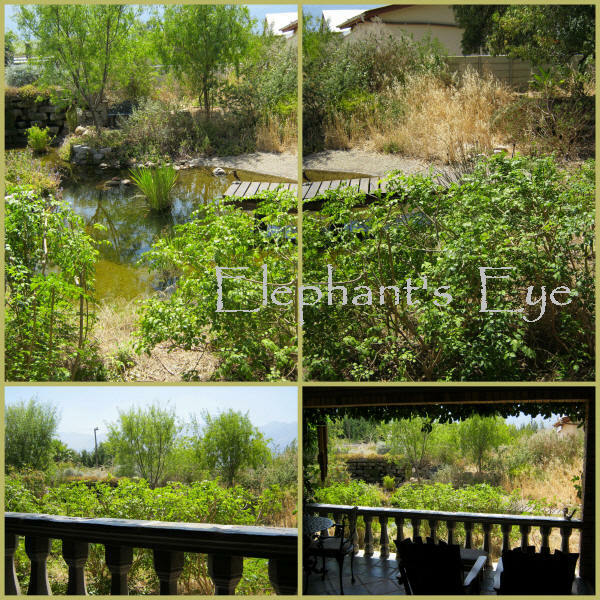 I love the Elephant's Eye Light Railway and the tranquil pond. Just to wonderful. The pond area has to be my favourite! What an enchanting garden you have!! Love the fact that your garden has so many areas and aspects to it. Lots of interest and micro-climates to enable a variety of plantings. Never boring! Just popped over after seeing your comment. You need to go into your settings to change the way your comment form appears - unless you've changed it back to pop up mode already? Diana, your garden is magnificent! One can see all the hard work you have put into it. I love the blooms of the Australian Bush Cherry...so striking. I have a sundial in my herb garden, however I have always envisioned one at the end of a path or in the center of the path. Yours looks great! Dear reader, can anyone USE those Reply buttons, to add an indented 'reply to existing comment'?? Works on VP's blog! Hmm - I've just tried your Reply buttons and do they work for me? Errrr no. I wonder what we have set up differently for our blogs? Interesting to see a broader view of your garden especially the pictures from the roof. 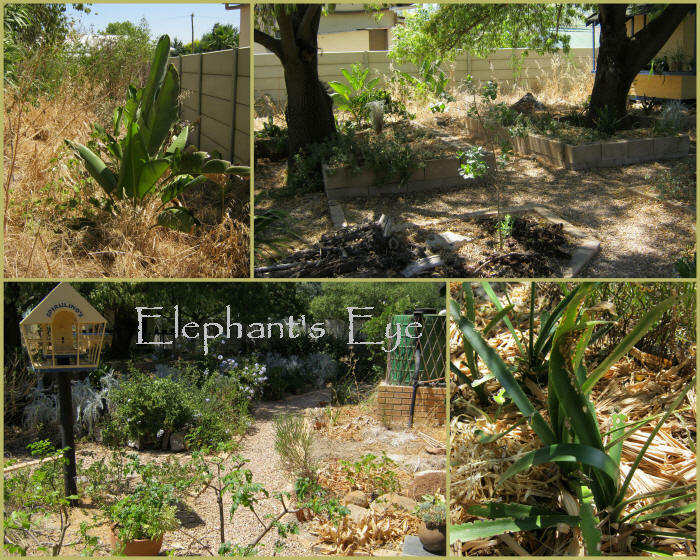 EasyGardener - we've been 4 years in the house. The little girls on one side - have outgrown their junglegym - , Hullo Auntie, hullo Uncle! - and those trees are now working hard. On the other side a row of 2 little boys, and cat, staring across the wall, have moved away - and we have trees! Loved seeing your wide views! You have a beautiful garden. I can feel the peace it gives. I am especially jealous of your pathways. What a wonderful tour ... I did not see the "don't look that way" part! 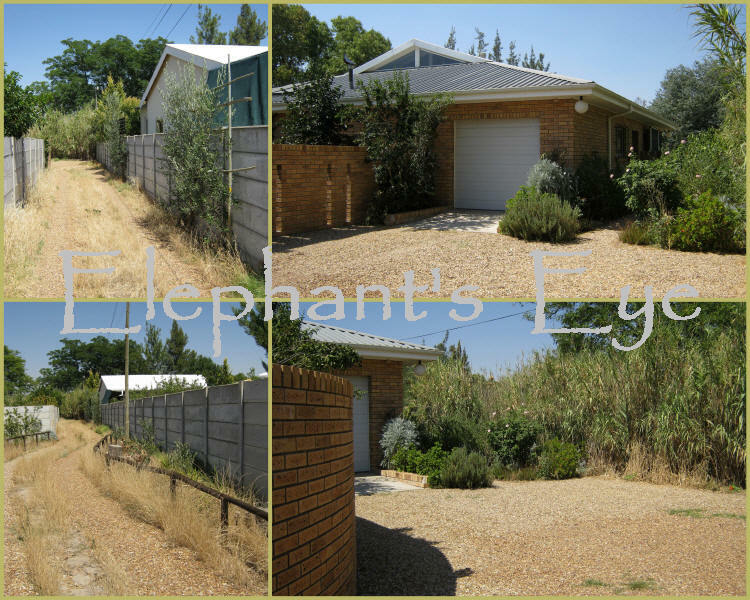 What an incredible garden/landscape/habitat/oasis you have created. Love the shady veranda. I vote for Rest and Be Thankful, the best thing to do in the summer heat! I appreciate the long views of your garden, still lovely in midsummer. My own garden languishes in July and August, when it is too hot and humid to work in the garden. Diana, you and the Ungardener and the garden have accomplished an amazing amount in four years--everything looks full and lush, especially for mid-summer with that sun beating down. I like what you say about letting the garden teach you. That's a lesson I'm beginning to learn. It really is almost like school--the same delight when you "get" it. I love your garden! It has everything one needs, I think. Some nice resting spots, some figs (I miss ours in Hungary) and lots of trees and shrubs. 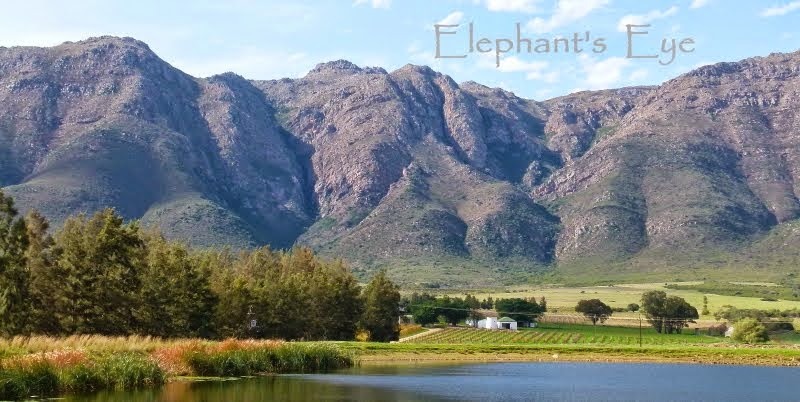 Your garden looks like a wonderful place to rest, laugh, and enjoy a great SA wine! Thank you for such a lovely walk through your garden. 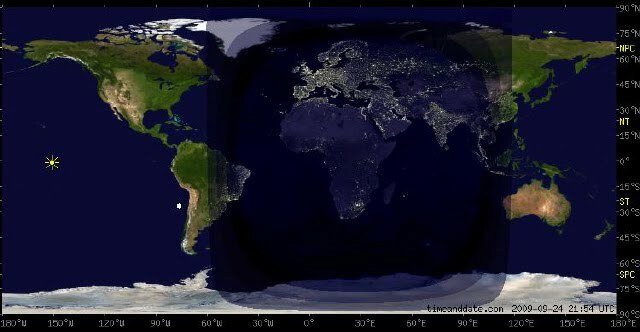 It is so very different than the Lot we have here. Happy GBBD! Diana, I see the "reply" link after your comments but when I click on that nothing happens. 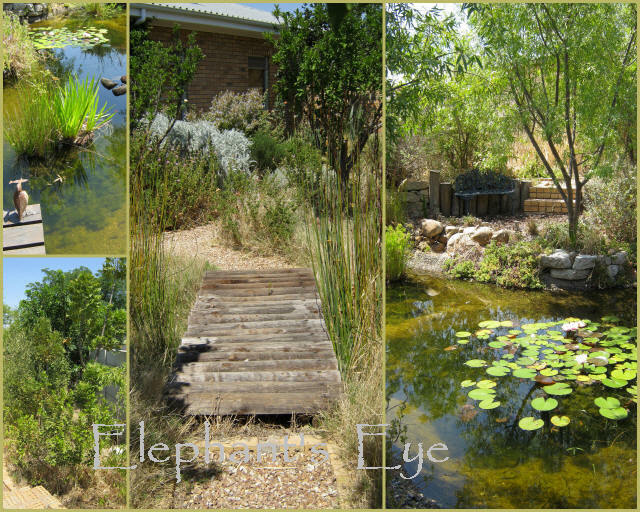 I love your garden .. every part, the pond is a favourite as is Paradise & Roses. You've created something very special there! Christine - sob - 'Reply' is a sore point. I've done what they said, but apparently I've tweaked something in the template. Not prepared to fiddle with chunks of HTML, so I've reported my problem. Waiting, politely and patiently, for Blogger/blogspot to sort it. This Reply option has only been out for a few days. Diane, What a great tour! 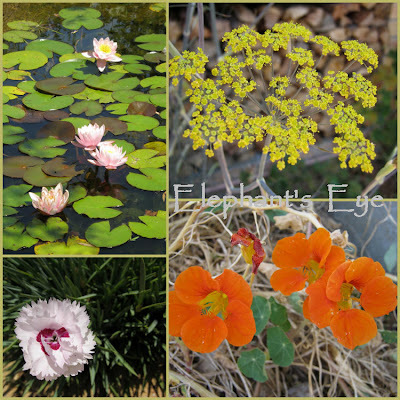 Beautiful photos, may your blooms continue to bring you great joy in the coming year! What wonderful contrasts in your garden. I also have contrasting habitat areas in my garden. I love your pond! I love your garden. Wild yet so organised. How absolutely delighted I was to walk through your garden. 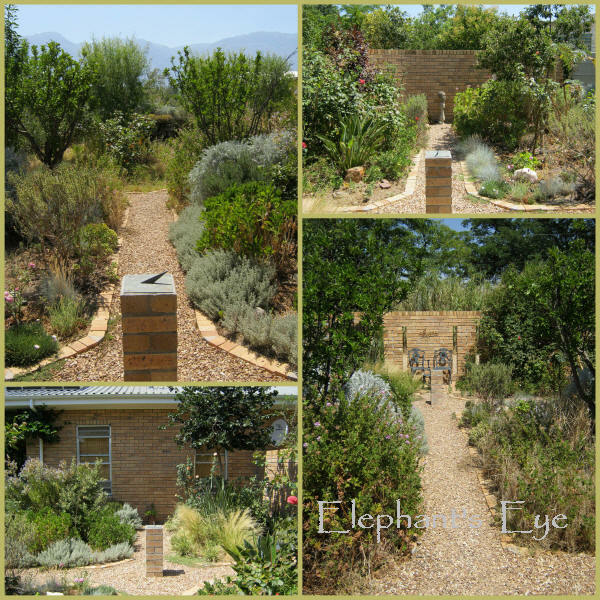 The restful pond area and the stoep overlooking the garden. I can totally relate to this. It is my kind of garden...wild with nature helping and the labour of your loving care to make it a place to live forever. The fruit trees give me inspiration and knowing you came with seedlings to this home, gives me hope. Thank you! Loved it! GRRRumble back to popup window for comments. I object to my apostrophe breaking up into code. 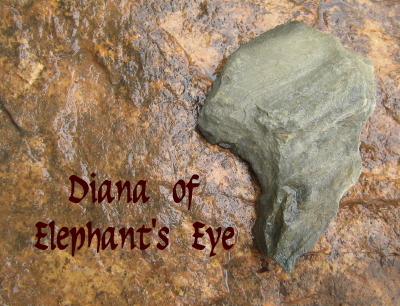 It is Elephant's Eye, not Elephant%$@#@s Eye! Will wait for the threaded comments Reply to get sorted on the Blogger/blogspot side. You have so many things! I have a very small garden so I have seating in two places so we can sit and look in opposite directions. The views are completely different, depending where you sit, so this arrangement doubles the size of the garden. 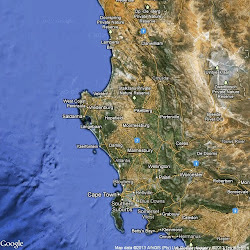 I can see from your tour that, indeed, you have a mix of microclimates. That always amazes me here, too. 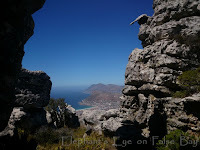 Some spots are literally baked by the sun at the height of summer, while others are more mild throughout the year. You have a wonderful collection of Roses! And the Water Lilies and fruits are so lush. Happy GBBD! Beautiful. 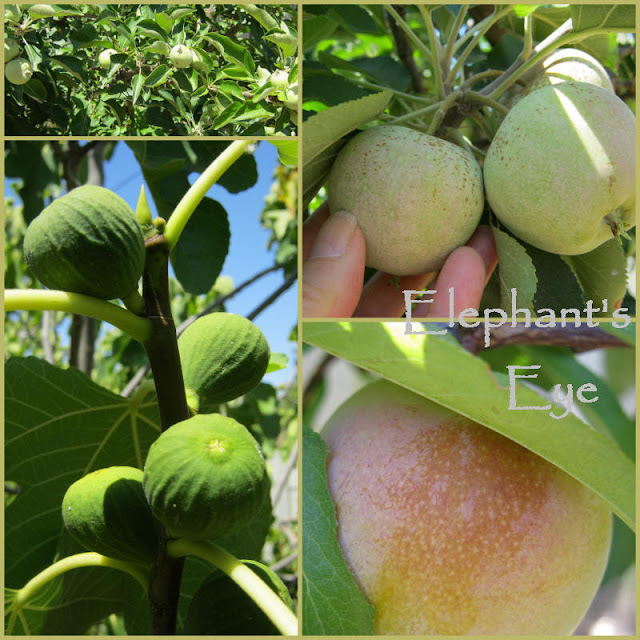 I'm very jealous of your fruit trees -- especially the figs. Diana, you might have to take me several times round your garden before I get the hang of it as there are so many aspects built in to what was a flat square. One minute tropicals and then the familiar roses - have not heard Elizabeth of Glamis spoken of for many years. The pond gives relief and the light railway a fascinating addition. Bird chatter and a book sounds the perfect way to end the garden tour. the pond especially is awesome, I am very impressed by your ungardener. How I enjoyed this morning walk through your garden, feeling the heat radiating upward from the stone paths, touching the different textures in my mind. All while the snow lies outside my window, covering the trees and sleeping beds of my garden. Yours reminds me of my own adventure in gardening at our former home. I built a crazy big garden - clippings and plants from all my friends - as we had lots of cleared space and mature trees. But now, we are tucked away in a forest clearing and my garden much more modest.